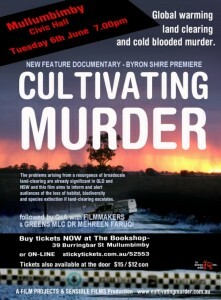 ‘Cultivating Murder’ Byron premiere screening is about the disastrous effects of broad-scale land clearing in Australia, & will be launched by Greens MLC Dr. Mehreen Faruqi who will also conduct the Q&A following the screening with the filmmaker Greg Miller of Film Projects. ‘Cultivating Murder’ screening in Mullumbimby is proudly supported in association with iQ Inc.
‘Cultivating Murder’ is a new feature documentary that tells the heart-rending story of the murder of Glen Turner, a public servant working for the Office of Environment and Heritage, who was gunned down on the side of a public road in Croppa Creek, 40 kilometers from Moree in 2014. Glen Turner was investigating illegal land clearing when he was murdered, and since his death we have seen the NSW Government throw out the Native Vegetation Act and replace it with legislation that will allow even greater broad-scale land clearing to occur, much as it has in Queensland. This film offers an insight into what large farming concerns and agribusiness see as the future and it does not include responsible land management and conservation of the natural environment. It reveals the pressure of recent rapid expansion in agribusiness as the laws protecting the environment are weakened across Australia.